This particular Caracal Models sheet is for the Valom 1/48 Britten-Noram BN-2, a kit we have only seen as an injected kit in 1/72, that being the Airfix kit. This aircraft was a considerably good seller with production also being carried out in Rumania for a period of time. As is the norm with successful aircraft, a stretched version, one with three engines, those with turboprops and a military version were also developed. Of the nearly 1300 built, about 750 are still in service. 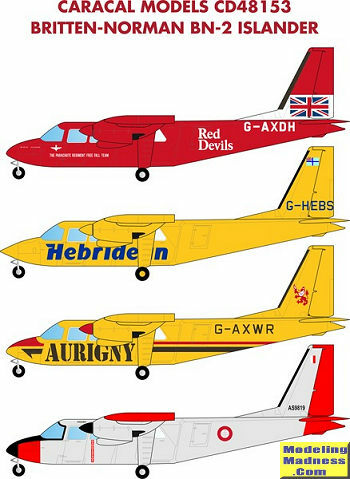 "G-AXDH", "Red Devils" Parachute Team in mostly red. "AS9819", Armed Forces of Malta in grey with international orange sections. 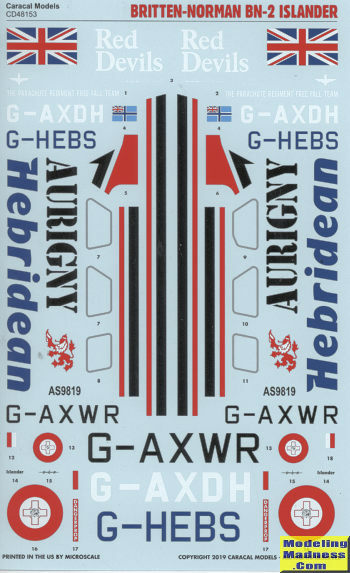 The decal sheet is superbly printed by Microscale and even includes a set of window frames in silver for the option you choose.